We checked out the top new features in Excel 2013 earlier. Today, let’s take a look at what’s new in Word 2013, and how it can make your documenting and collaborative tasks smoother and easier. As with Excel 2013, the most significant feature improvement is the shift in focus to use the application on the cloud and on mobile devices. This is good news for workers who do a whole lot of collaborative work, but it also means you now carry your work home and it becomes a part of your personal space. There’s a fair bit of features you will enjoy using in Word 2013, but still a few of them that disappointment. We’ll start off with the first disappointing factor, the Interface. Microsoft Word 2013 has all the features of Word 2010 and even more, there’s the Ribbon with all its tabs and groups, blank workspace, the File tab which holds all templates and saving options, and status bar information at the bottom of the screen. Yet, you may have never worked upon a more ugly looking piece of software in your life. Gone is the easy peasy, nice and breezy looking colors and fonts. Instead you’re stuck with what looks like a prototype design. The background colors are a choice between white and shades of grey. There;s a new element called Office template design, which reflects above the Close button. It is a complete annoyance as it sometimes covers up the buttons and is just better off left unused. It is really hard to work with a software that looks so putting off. The Read Mode is now in a more attractive two columnar format, ideal for viewing on mobile and touchscreen devices. 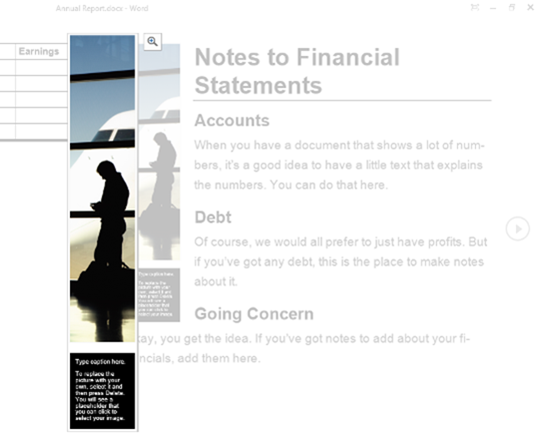 The editing tools are still available from the menu at the top left of the screen so that you can still perform your editorial functions in the Read Mode. The Read Mode also offers some cool functionality such as a sidebar, where you can add your thoughts on the page, and paragraph toggle markers that can expand or close paragraphs. Word 2013 has a more interactive element to it. If you are working with a touch device, you can simply double tap to zoom in to objects such as charts, images, and tables. Otherwise a simple double click will suffice. Toggling between a double touch or double click is a more natural way to zoom in and out and Word 2013 lets you do this. Easy! Left off a document on a page number you can’t remember? Word 2013 takes care of that for you. You can reopen the document from anywhere, on any device, and you can continue reading from where you left off. Who would have thought of watching online videos in Word? Now this is possible, so you can both understand the content while watching the video. You’ve always had to use online PDF converters and such tools to work on PDF documents. Word 2013 saves you the hassle. Whether it is editing text or tables, you can open PDFs in Word and work with the file as you would in Word. Just as you can add online videos on to your Word document, you can also add pictures from online photo services such as Flickr, or Instagram. That’s not all. You can even find creative commons images from Bing Search and pop them on to your document, just like you would with ClipArt. 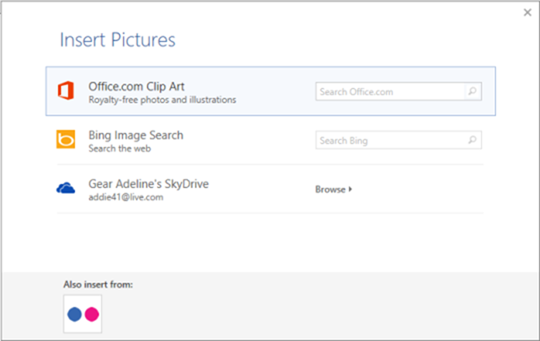 The only disappointing factor about ClipArt search is that its only keyword based and additional filtering tools such as videos, illustrations, and images that were earlier available in Word 2010 are missing. Subtle changes such as this certainly may not sound like a big deal, but a tool should work for you, and you shouldn’t have to change the way you work to suit a tool’s functionality. Arranging images and text in documents has always been a pain. It just never sits where you want it to and you just grumble and keep on at it until you get it right. Word 2013 attempts to alleviate this suffering by offering an alignment guide and a live preview option to line up other elements as you want them to appear in your document. Working simultaneously with colleagues in the cloud is tough, but Word 2013 tries to make this easier with its collaboration tools. Markups have been streamlined so that you can still read your documents in a clearer environment while still being aware of where tracked changes have happened. Less clutter goes a along way. Comments now have a cool reply button, making for easy tracking and discussion. And when the comment has been closed, you can mark it as done and it will get greyed out and cleared out of your way so you can focus on stuff that matters. You can also present a document online in a meeting without any additional setup. Just create a link to the document to share with people, and using your Microsoft account credentials, you can present your stuff and even make them available for download. That wraps up most of the new features in Word 2013. Is there a feature you particularly liked using?